Medicated Follower of Fashion: Polarn O. Pyret - Easter Egg Competition! If you read my blog regularly you'll know how much I love (and I do mean love!) Polarn O. Pyret's clothing. We've been lucky enough to review clothing for them before, but I've known about them since Ethan was in my womb. He's always worn their clothing. They wash and wear well and Polarn O. Pyret are a lovely company who love to involve their customers (follow them on Facebook, they are always asking for customer input!). Well, I'm happy to tell you that PO.P are running a competition for Easter! 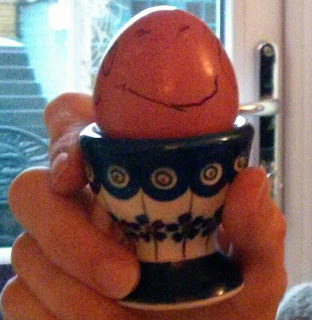 All you have to do is decorate an egg with your child (preferably a real egg) and send a photograph of your creation using the form on their Facebook page - couldn't be easier! If you are a lucky winner you will receive a PO.P bunny and the overall winner will receive a £50 voucher to spend with PO.P! For many of us it's the Easter Holidays so it's an activity to fill some time and stay out of the cold! You have until 5pm on Friday March 29th to enter so get decorating! Ethan and I decorated our entry yesterday. I "blew" an egg for the first time and it was hard work, I have to be honest, but at least we have an egg that we can keep now, not one that's going to smell after a couple of days! I let Ethan have total free reign with the decorating. He chose to draw "a smiley face". I'm not sure we've got a winning entry here, but it's 100% decorated by Ethan so I'm proud of that. I think it's a lovely effort and something we'll keep forever! You can probably tell from the photos that Ethan was wearing some vintage PO.P clothing. A happy coincidence. Nice and comfy for chilling out at home in! These are third hand and still going strong, you can really tell the quality. 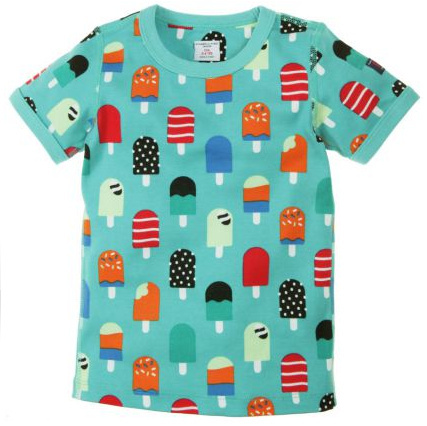 Some of the best children's clothing you can buy and I don't say that lightly! I can't really finish talking about PO.P without including my current favourite item of clothing from their collection, so I'm going to show you this gorgeous tshirt. Let's all just take a few minutes to look at it and imagine the summer that awaits us... Warm weather, come on!